Beccles Free School a grammar school education "just for middle class children"
Following my earlier blogpost on the Beccles Free School proposer and spokesperson Tony Callaghan I have been sent some more posts that he made by people on Twitter (thanks for that!). These posts were removed by the TES from their website for breaking the Terms and Conditions. Now there is nothing wrong with private schools - I myself went to an independent secondary Grammar School although my children all attend state schools. But it does seem notable that at the same time he was organising strike action in state schools his own children were unaffected in a private school. And Callaghan clearly sees free schools as operating a self-selection process that means that "feral" children (which he amusingly misspells) will not end up there. 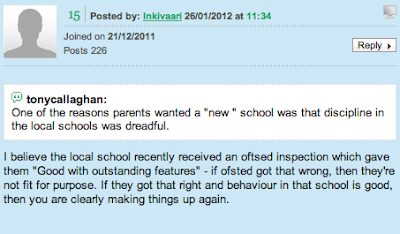 Presumably these "feral" children would remain in local "bog standard" schools like Sir John Leman High School that Callaghan seems to be referring to in this post causing further "discipline" problems. Inspectors explored each of these issues, but agreed with the large majority of parents who completed the questionnaires and who were highly supportive of the school. I wrote a more detailed Blog Post about this when the Seckford foundation repeated - albeit in a much less extreme way- this kind of allegation. The source of these kind of views is now much more clear. In another deleted post taking personal credit for saving middle schools in Bedford he describes himself as "heading up" the free school bids in both Beccles and Saxmundham. He also suggest the move to two tier in Suffolk is design to save money. An allegation that seems difficult to understand. This would result in a "Titan School" in Beccles. He also describes the free school as offering a "grammar school" education. In fairness to Callaghan he tells it like he sees it. The Beccles Free School is a middle class grammar school for middle class children not those nasty "feral" children who have parents that don't care. They can all stay at Sir John Leman where they are not his problem. When Gove announced his free school policies many of us expressed concern that they would become elitist projects to introduce further social segregation into our schools. And this is a particular shame for our successful and socially inclusive Suffolk schools. These are schools where the vast majority of local children rich and poor, academic and not so academic, gifted and needing a lot of support all go to school together. But they are balanced and well ordered schools - nothing like the rhetoric of Callaghan. I have asked the Seckford Foundation to comment on the views of Mr Callaghan. I have already suggested that Seckford have presented a somewhat patronising approach to prospective parents and that was before I was aware of these posts. The DfE champion free schools as offering improved schools for all but Mr Callaghan is perhaps more honest about it. The narrow curriculum and elitist approach is deliberate. Nice middle class children only are welcome at the Beccles Free School. More revelations from Callaghan's posts will come later and - hopefully - a response from the Seckford Foundation. I have written to the Chair of Governors asking for a statement.